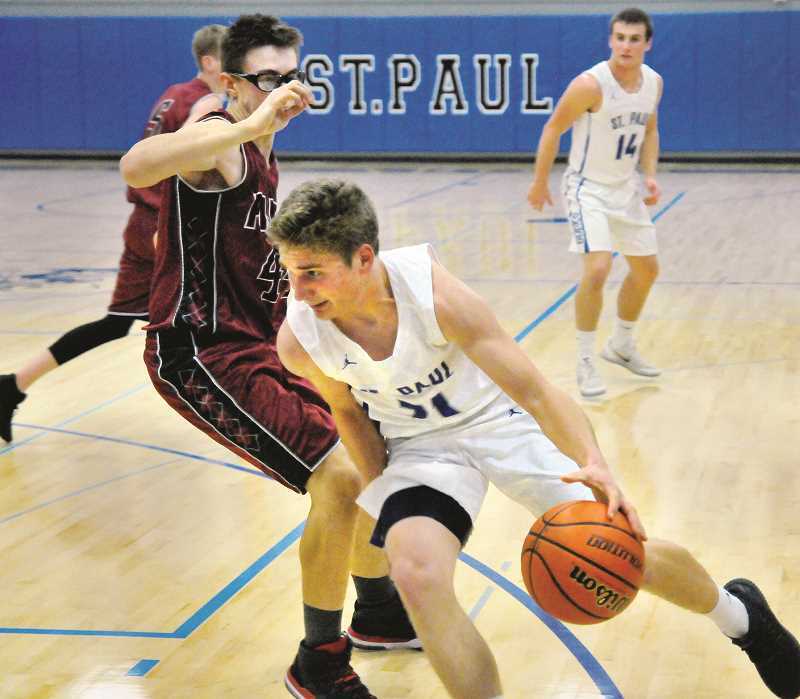 The first quarter of Monday's win over Perrydale was a window into the St. Paul boys basketball team's potential. The Bucks were playing at a rapid pace on offense and forcing turnovers that led to transition opportunities. But with about a minute left in the quarter, junior post Alex Dela Cerda slipped on a wet spot and doubled over in agony. Dela Cerda appeared to injure his right knee on the play and he was helped off the floor by coaches without putting weight on the leg. He did not return to the game. 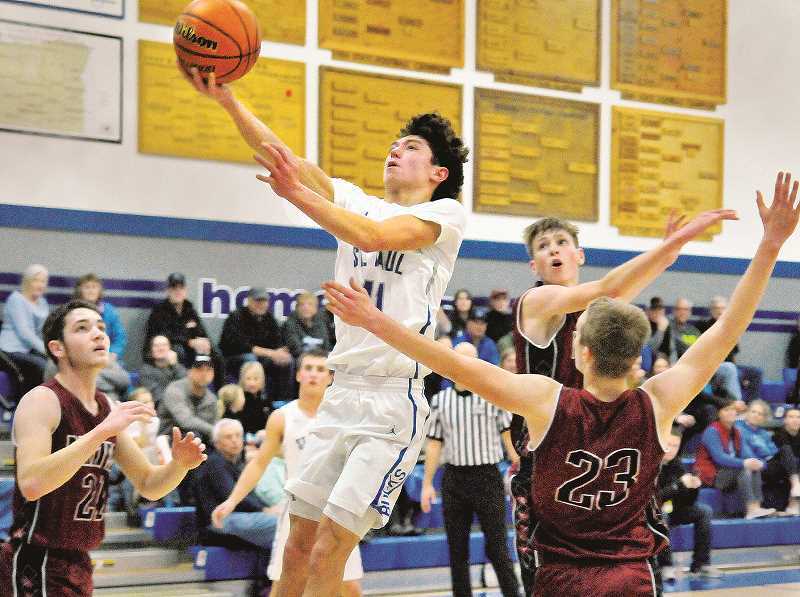 The Bucks won 65-35 and dominated Perrydale in all facets, but Dela Cerda's future looms over the team as it enters a crucial stretch of the season. The hulking three-sport athlete is a key component of what the Bucks do, and he was just working his way back into the fold after missing a large portion of the season due to a family commitment. "Even the little bit that he was in there, you can see how he transforms our team," SPHS coach Todd Swan said. "We have guards and we shoot the ball well, but he's what completes our team. We're a different team with him down low." It was 17-7 St. Paul after one quarter. Even without Dela Cerda in the middle, the Bucks (13-5, 9-1 Casco League) continued their stellar play en route to a fourth straight win. They did it thanks in large part to a 23-point performance from senior guard Jaidyn Jackson. Jackson has provided scoring and emotional leadership for the Bucks all season. On Monday, he dropped 16 of his 23 points in the first half, including a buzzer-beating three-pointer off the glass that gave his team a 33-20 advantage at the break. "We started off trying to do a few different things defensively and that was part of the reason we started off slow," Swan explained. "We've traditionally been a slow starting team, but we ended up shooting the ball very well and playing great basketball. So far, the team that has shot the ball well has won the game when we play Perrydale." The Bucks opened up an insurmountable lead in the third quarter, outscoring the Pirates 22-5 and hitting four three-pointers. The final frame was an opportunity for St. Paul's subs to get in the game and gain valuable experience against a league opponent. Overall, it was an impressive effort for the Bucks against one of the better teams in their league. The Pirates (13-6, 9-2) sit just behind first-place St. Paul and above third-place C.S. Lewis Academy (12-8, 8-2) in the Casco League standings. Swan said the Pirates, Watchmen and Bucks are emerging as the top teams in their league, but the field is beginning to strengthen as the season enters its home stretch. "Our league seems to be catching on the second time around," Swan said. "Falls City is getting better and Crosshill's best player is coming back from injury. It's going to be a battle this second half and I'm excited to see how we finish this one out." Beating Perrydale by 30 is no small feat. It ties the series 1-1 between the teams and shows that St. Paul is capable of playing quality basketball without Dela Cerda in the middle. The question remains whether the Bucks can keep it up and ride this wave of momentum into league and state playoffs. Next up for the Bucks is a road game at Jewell on Friday night with five games remaining after that. Next week features a pair of home games on Jan. 29 and Jan. 31 against Oregon School for the Deaf and Livingstone Adventist – both slated to tip off at 7 p.m.
For now, however, Swan's team waits anxiously to hear the extent of Dela Cerda's injury. The Bucks hadn't received word as of press time on Tuesday morning. While they wait, they can revel in a dominant win over a quality Perrydale team. "This game was the best we've ever played since I've been here," Swan said. "Offensively, they were confident and everyone was attacking. Defensively, they executed to perfection."